The Creative Curriculum is a comprehensive early childhood educational system that emphasizes a practical, easy to understand approach to working with children. It promotes the use of interest areas as a way of providing experiences that promote cognitive, social, physical and language development. Interest Areas: Dramatic Play, Art, Sensory, Building & Blocks, Library, Puzzles & Table Games, Outside and Discovery. The Creative Curriculum balances both teacher-directed and child-initiated learning, with an emphasis on responding to children's learning styles and building on their strengths and interests. This research based preschool curriculum applies the latest theory and research on best practices in teaching and learning and the content standards developed by professional organizations. 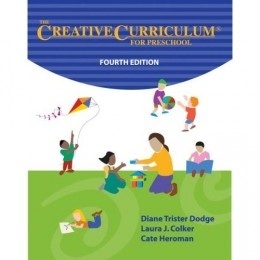 The Creative Curriculum for Preschool clearly defines the teacher's vital role in connecting content, teaching, and learning for preschool children. It features goals and objectives linked to our valid and reliable assessment instrument. Cognitive: to help children become confident learners by letting them try out their ideas and experience success, and by helping them aquire learning skills such as the ability to solve problems, ask questions, and use words to describe their ideas, observations, and feelings.